Our MonsterShop racking range is tough enough for a warehouse and affordable enough for the home. 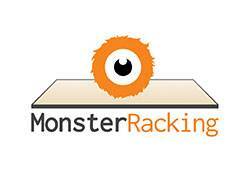 Get professional quality storage for your home or business with the MonsterShop range of resilient racking. Our T-Rax and Q-Rax range are super easy to construct. Using an innovative key lock system, each unit can be built without the need for nuts, bolts or power tools, just a simple rubber mallet. Our heavy-duty, stainless steel Q-Rax shelving can handle up to 200kg of evenly distributed weight. Each unit is solidly constructed, featuring rubber feet for added stability. The MonsterShop T-Rax shelving range is another completely unique racking range that take an incredible 280kg of evenly distributed weight per shelf. Finished with four layers of robust paint, these units still stay in pristine condition for longer in even the busiest environments. Our T-Rax and Q-Rax shelving units come with free UK mainland delivery.